I’ve had two transplants with Transmed in Istanbul since May 2010, under Dr Melike Kulahci. 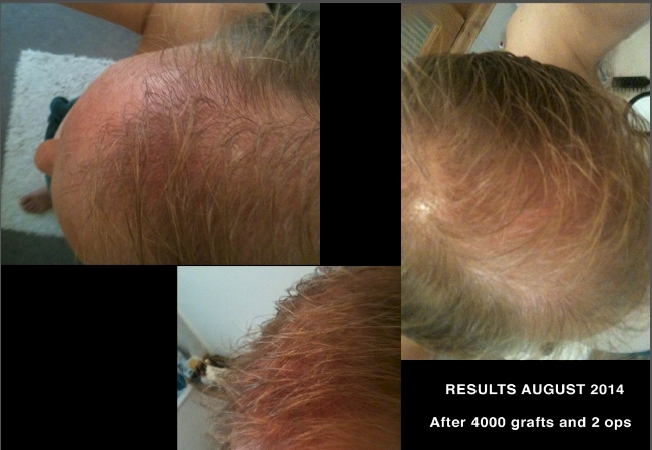 Total 4000 grafts: 2100 grafts in the first operation, 1900 in the second, plus a PRP procedure. The images show my initial condition and the end results last August. I was very unsatisfied with the density of hair achieved. The rep of a leading hair surgeon listed on this site also felt this density was unsatisfactory, given the number of grafts transplanted. During the two procedures, Dr Melike Kulahci was only present during the graft harvesting and not during the actual implantation of the grafts. I have read that it’s vital for the surgeon to perform this part of the procedure. Dr Melike has not been in touch with me since I wrote to her to complain about the poor final outcome in the autumn of 2014. Instead I have only had contact from a deputy at Transmed, Mr Nahhas. I have been requesting a refund for the second procedure, but Transmed have informed me that all they can offer me is a further transplant, at a cost of €700. They are recommending further grafts in the frontal cortex. These areas have already been transplanted, (TWICE) and since there was no native hair in these areas to begin with, this is as good as admitting that the two operations I’ve undergone have not been successful. Why Dr Melike Kulahci expects me to risk a third procedure is hard to understand. Particularly as I have found other patients online who have experienced similar density problems. (Please see below.) As I write, Transmed are still not agreeing to refund me and Dr Melike STILL hasn’t made contact. Haartransplantation in Istanbul ERFAHRUNGSBERICHTE (Haare).Die Entnahme muss der Arzt machen, das stechen der zu f?llenden L?cher f?r die Transplantate muss auch der Arzt machen. Darauf w?rde ich bestehen. Denn das sind die entscheidenden Vorg?nge bei der Transplantation. Das einf?llen kann durchaus von Arzthelferinnen gemacht werden, da da bereits die Wachstumsrichtung durch den Einstichkanal und der Abstand vorgegeben ist. Also die Arbeit ein reines Auff?llen der L?cher ist. What happened the 2nd time ? You must be happy with them the first time, otherwise you wouldn’t have gone back for a 2nd surgery.